I’d like to introduce you to one my latest work outfits – this one including blue boots. I’ve been known as a collector of boots. I LOVE boots of almost every style and length. When I first saw this tall blue suede – waterproof! – pair in the store last year, I was hesitant at first. I figure that black and brown are safe colors, because they go with almost anything. But these blue boots caught my eye. Fortunately, styling them is less tricky and much more fun than I imagined! I took these shots in Santa Cruz, California. We got to spend Thanksgiving week in this gorgeous area! You may have noticed that pant suits have been sort of a thing lately, and this is a variation on the theme. Sure, I love a matching pair of pants and jacket, but I also love an opportunity to mix and match. Here I combined a very structured, box-like Theory jacket with free-flowing wide-legged pants by Eileen Fisher. To emphasize the geometrical slant of the jacket, I combined it with a sweater which you might remember from this post and which features a stripe of leather. The Murano-glass pendant echoes that vertical line/stripe. I generally avoid boxy sweaters and jackets, but the fact that this one is cropped allows for the silhouette to narrow at the waistline. You could say that it even resembles the forever-coveted hourglass figure. Perhaps you’ll remember how I styled these pants for warmer weather in a previous post. I’ve found that narrow-toed, tall boots are the way to go this season with cropped wide-legged pants. Not only are they extra warm, but they are also great for leg-lengthening – especially when the pants and boots are in similar tones. I actually did a photo shoot with narrow-toed ankle boots, and I ended up having to scrap the whole thing. My legs looked like stumps! 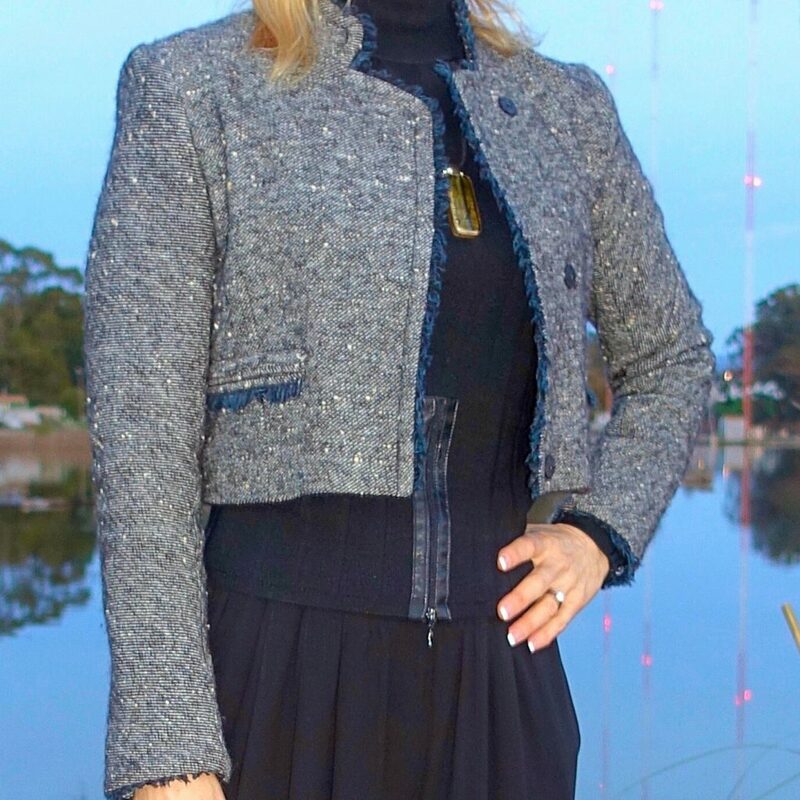 Although I’m not at all against wearing all black with just the pop of color of my blue boots, I love how this jacket subtly echoes the blue color in the fringe lining the pockets, collar, and sleeves. The olive-colored glass pendant just felt like a necessary addition. And speaking of blue, you may have read that it is a dominant color in the fashion world for fall/winter. Pairing it with black may seem counterintuitive. But, I love how the blue makes the black look more intense. I think, however, that it helps to try to go with varying textures, so that one color doesn’t just “bleed” into the other. So, what do you think of blue boots, and do you like to wear black and blue together? You are so classy Janea, perfect from head to toe… great job! Loving the cropped jacket, lady! Super chic! Love how sophisticated yet cozy the outfit is, perfect for winters! What an amazingly feminine and elegant look my dear Janea! You look sooo beautiful! I really like how you play with cuts here to show us your amazing silhouette!! Black and blue may be one of the most known fashion rules of combos to avoid, but I think it’s just another one dumb fashion rule! I have seen some amazing blue and black outfits lately with large or small proportions of blue like yours! Simply amazing! Thanks so much for sharing and wishing you a great start to the weekend!